thezodiackiller.digitalzones.com > Topics > 0 & NOT HODEL Only Jack is ZK BD & More CHEROKEE Syllabary in Letters! 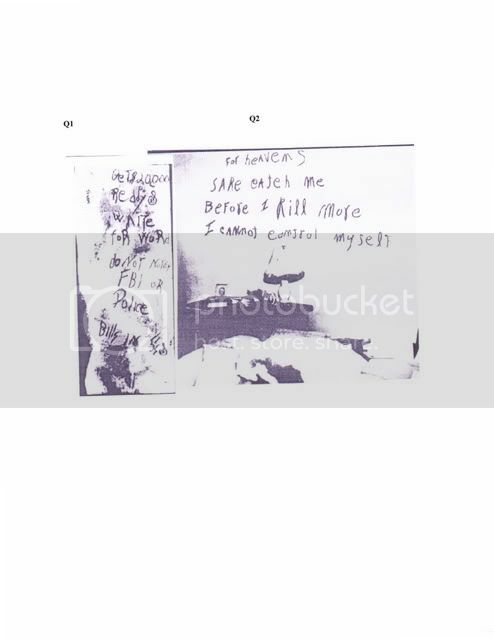 I am showing Cherokee Syllabary Comparisons from 1940s Black Dahlia & Lipstick Killer, Zodiac Killer, 1990 John Walsh Scorpion Letters, 2002 Tom Voigt Singapore Letter, 2005 Tim Miller Texas I-45 Killer Letters. 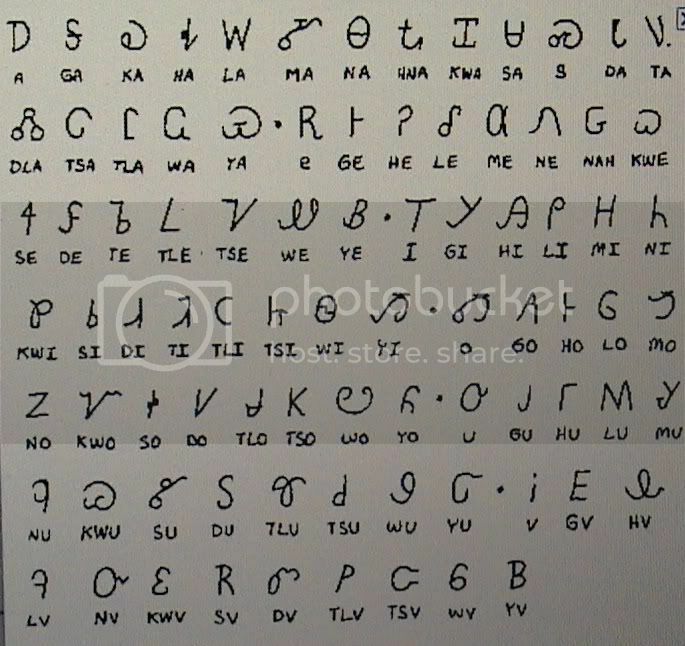 Aside from the mostly Native American symbols and clues in Zodiac Killer & Black Dahlia, the rare Cherokee Syllabary shows up in all of these alleged criminal communications that Jack is suspect in. 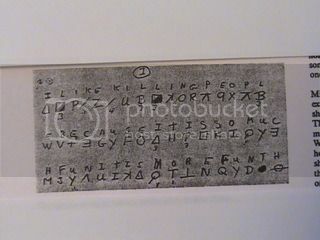 Only if Hodel & other "suspects" not backed by FBI could read & write, have access to Cherokee Syllabary in mid-20th c, would they be even close to being the right suspect. THIS DEFINITELY RULES OUT HODEL! Shame on John Walsh for supporting Hodel as a suspect for Black Dahlia in the CNN Anderson Cooper 360 Cold Cases: Black Dahlia, Zodiac Killer, Biggie Smalls & Tupac Shakur interview. Shame on CNN for not focusing on facts FBI says Jack Tarrance wrote Zodiac letters. I will not respond to anyone else besides Nanette Barto & Dennis Kaufman at this thread. The following pictures are for public to see for themselves. Thank You Cherokee Nation for sharing the many versions I found online with the global internet. 1st 1 is for modern scripts for publications. 2nd 1 appears to be what are taught in Cherokee schools for handwritten script but also publications. The 3rd is common modern Cherokee Syllabary for books, manuscripts, newspapers, reading & writing. 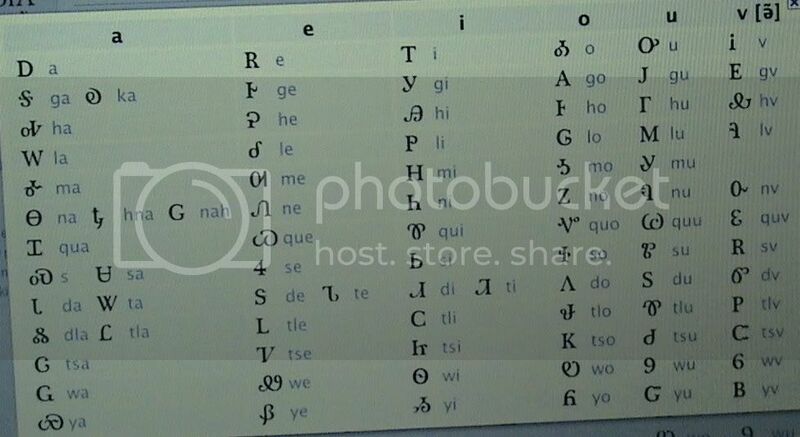 2nd to Last 1 is another version of Cherokee Syllabary for publishing, reading and writing. 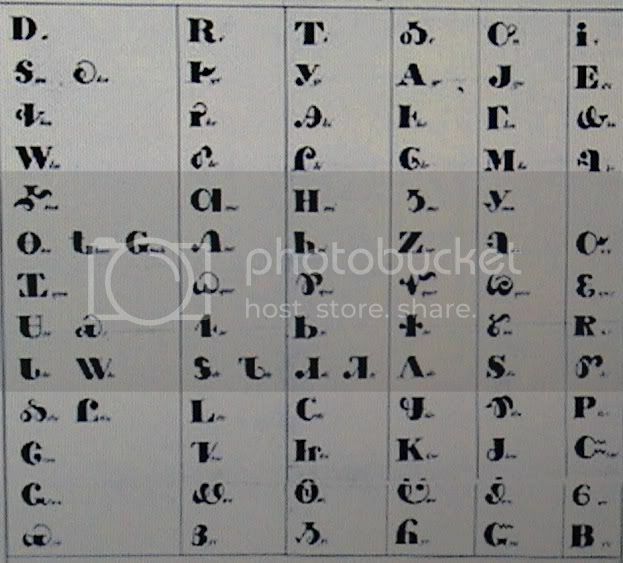 Last is supposed to be the original early 1800s Sequoyah Syllabary for the Cherokee Nation to use. 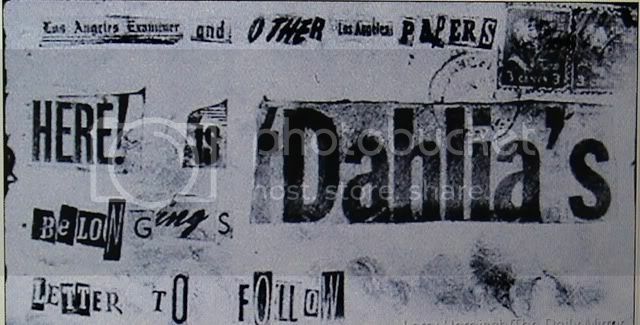 I will start with Black Dahlia Cutouts from various publications. S-shape in Papers B-shape in Belongings, T & R-shapes in LeTTeR, possibly W-shape. DID HODEL COME FROM OKLAHOMA/TEXAS WHERE THEY TAUGHT CHEROKEE (still do) and HAVE ACCESS TO THEIR PUBLICATIONS? NO but JACK GREW UP THERE and lots of Cherokee blood in that region! Handwritten Cherokee Syllabary Z-shape in Zodiac, i-shape in Chronicle. 4-shape in 1800s Lincoln potrait stamp! Last 1 for today! Tom Voigt's 2002 Singapore Letter with Tse Koo Choy packets & Zodiac letter matching JTs writing. Tse is Cherokee Syllabary that looks like T&V combination! YES, VOIGT! You got an authentic letter but shame on you for hiding that fact! Edited 7/25/11 There's also Koo(h) here, too. 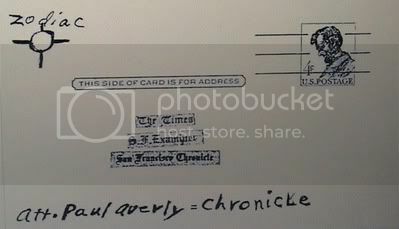 EDITED/UPDATED 7/25/11 Hardens rare Vallejo newspaper version from a criminology reference book that only I have. The online scans don't show details. Several Cherokee Syllabry here not to mention the Native American Shoshone & more but I am sticking with Cherokee Syllabary at this thread. Please check back as I will add more. But how does the killing of Elizabeth Short avenge the Native Americans? I am not saying that you are not seeing Cherokee writing, but where is the motive, if Jack is supposedly avenging the Native Peoples? Ashlee, you question is valid and catseye danced right around it which is typical of her "far out" conclusions and her poor manners. The Navaho language, as you probably know was used as part of secret and critical communications during WWII to keep the Japanese military from finding out things. Any symbol can be employed in a cipher but that doesn't mean that the one should draw all kinds of assumptions as cateye has done. This is typical of her condescending behavior towards others and it's the typical thing she does by mixing a bunch of "far out" theories in with reasonable facts thereby blowing the credibility of the basic case of Jack Tarrance's involvement in these heinous crimes. Look at the sheer arrogance of the footer in her postings, if the case hasn't been publicly acknowledge by LE and the FBI so far how can she make such a claim...the answer is she can't, besides it isn't gonna "lock the doors" it would open the doors. Cherokee Syllabary seen in Tim Miller Equusearch 2005 Texas I-45 Letters: W-shape (West), B & Z shapes. In fact that B looks like the ones I drew for the re-created Harden's Zodiac symbols. It looks like what is found in Chaco Canyon buildings kivas sections where they sometimes buried the dead. Una Vida is in a RADIAN shape & is still unexcavated. Many people lately claim Hodel is a great Zodiac & BD suspect due to similiarities seen the cases, that he continued his evil campaign. 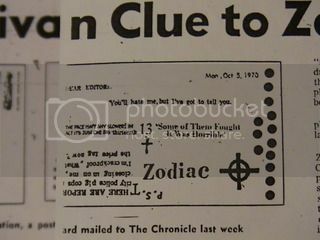 WELL, aside from the Native American symbols in Zodiac communications, the Syllabary that's in Black Dahlia, Zodiac Killer, (Scorpion letters too), Voigt Letter & Miller Letters.... rules out Hodel as he was DEAD 1999. He was 69 1970 and nearly 100 yrs old 1999? 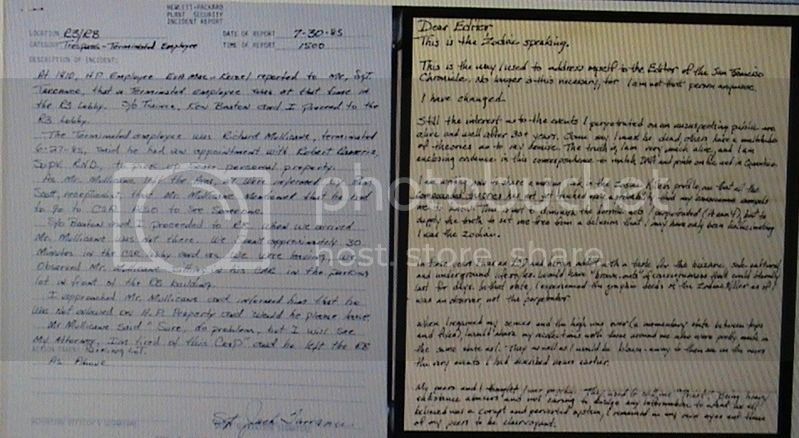 Jack is completely ruled back into these cases AND NANETTE BARTO already did the handwriting comparisons showing JT is it with FBI agreeing Jack authored ZK communications. Well, in all fairness to catseye I think that the linkage on observations made by her on the symbols are interesting and basically good but remember that if Jack was into cyphers as we have good reasons to believe he was; that anyone in that field might very well use native American symbols. What I am uncomfortable with is when she makes all encompassing assumptions about Jack's frame of mind and would have others believe that his motivations are based on avenging native Americans, she can't know that. Otherwise she's made some good cross-connections. I have a book from Feral House Press (the name escapes me right now) that has a chapter on schizophrenic letters to various newspaper editors. Let me state this before I go on: This is not a personal attack but an observation. 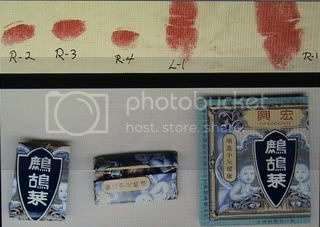 Catseye's collection of evidence look exactly like the examples in that book chapter. Its kinda scary. I hope she is OK.
Then again terry you mentioned in earlier posts that you thought she was out to destroy Mr. Kaufman's case on purpose. I won't go that far as I have not been around long enough to make that judgement. Either way she is not helping his cause if you ask me. And she is not posting here to engage to discuss. She says so herself and if you ask a question you are a troll. I was shocked to be called that on my 3rd reply. I have some ideas that may help make this place a bit more friendly. How about a TOS (terms of service) that all members need to follow and if you infringe you get a warning and then a temp ban and then perma bane. This would apply to everybody. Stick to the rules or you are outta here. This has worked on many gaming forums I have joined so I think it would work here too. 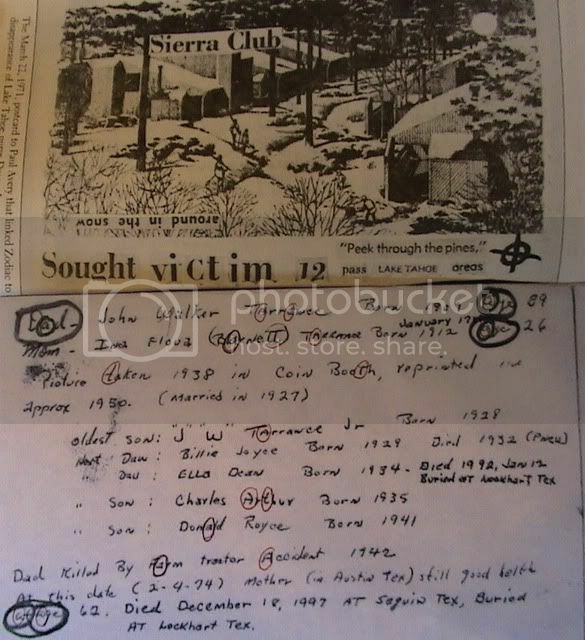 Also maybe Catseye her own sub forum so if wr are interested we can go there and look rather than have theories that Dennis doesn;t agree with in the first place clutter the really good threads with the great evidence pointinf towards Tarrance as the Zodiac and possibly other serial killers? Seems like the most logical way to go no? I don't know that we disagree and I can't tell with perfect certainty if her goal is to destroy Mr Kaufman's case but she certainly has that effect. I also agree with your hint that she is schizophrenic, from time to time she comes off as coherent. catseye has announced that she has money into this board which may explain why she is still posting here. I can tell you this; if I was to head up an investigative team I'd want some people like her except that I would then need plausible deny-ability that I used her because the opposition could have a field day with her reports. I point out that she might come up with something that others might not. It's a lot like the police resorting to a psychic for a clue, it isn't accepted as legitimate. The so-called psychic medium business may have some scientific basis the same way radio wave do; you can't see them but they do work, the same way you can't see gravity, the problem is...is that the psychic medium lacks solid proof that it works. It's many of her conclusions that I disagree with. 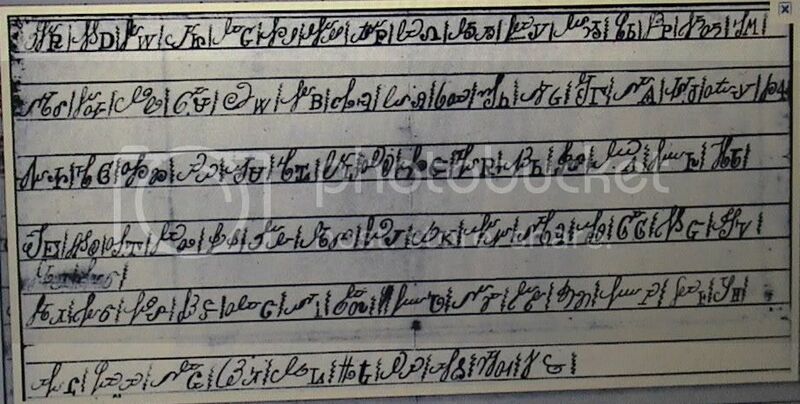 Here's what I think is valuable about this thread; catseye has shown a connection to some of these symbols, also notice in the handwritten "family tree" note that he penned; he makes use of typewriter type of font for the lower case letter "t" in his printing, this is unique and shows up in many of the suspect documents. Also notice his narcissism is apparent with the way "J" and "W" are largest and in quotation marks, the items circled are important. However the number "4" on the 4 cent postcard is something he'd of had no control over. But the "W"s formed like two crossed V's is very good, they run through key documents, the "R" on the Dahlia letter is interesting too, the "S" maybe too as well as the "T", I was captivated by the cursive "ing" in belongings, it reminds me of the cursive in "Speaking" as found in many of the Zodiac letters as well as the JonBenet Ramsey ransom letter. These things are a "good find" on catseye's part, however; some of her conclusions and methods I'm not in agreement with. Otherwise I think she did a good job of it. Oh yeah, I almost forgot, I read Hodel jr's book and the evidence he offers was thin to none that his dad killed E. Short aka the Black Dahlia. OK but do you have any actual documented proof that JT contacted Belli besides the one disguised handwritten letter and does that match JT's also? It seemed very different from all of the rest of the Z letters. catseye's site is almost impossible to read, no paragraphs, leaps in subjects, leaps in logic, broken syntax, letters to and about Fabian, half naked images of a middle aged woman, random thoughts etc etc etc....geez.